"One of the best mysteries of all time" (The New York Times)--Josephine Tey recreates one of history's most famous--and vicious--crimes in her classic bestselling novel, a must read for connoisseurs of fiction, now with a new introduction by Robert Barnard. 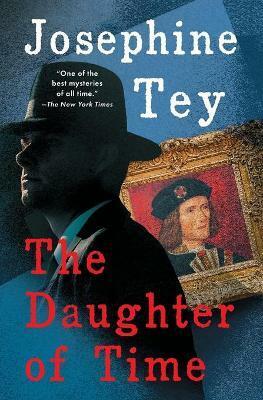 Inspector Alan Grant of Scotland Yard, recuperating from a broken leg, becomes fascinated with a contemporary portrait of Richard III that bears no resemblance to the Wicked Uncle of history. Could such a sensitive, noble face actually belong to one of the world's most heinous villains--a venomous hunchback who may have killed his brother's children to make his crown secure? Or could Richard have been the victim, turned into a monster by the usurpers of England's throne? Grant determines to find out once and for all, with the help of the British Museum and an American scholar, what kind of man Richard Plantagenet really was and who killed the Little Princes in the Tower. The Daughter of Time is an ingeniously plotted, beautifully written, and suspenseful tale, a supreme achievement from one of mystery writing's most gifted masters. Elizabeth MacKintosh used two pen names during her writing career: Josephine Tey, who was also her Suffolk great-great-grandmother, and Gordon Daviot. She was born in 1897 in Inverness, Scotland, where she attended the Royal Academy. Miss MacKintosh later trained for three years at the Anstey Physical Training College in Birmingham, then began her teaching career as a physical training instructor. She gave up teaching to keep house for her father, who lived near Loch Ness, and pursue her writing. Her first book was The Man in the Queue (1929), published under the Gordon Daviot pseudonym, and it introduced the character of Inspector Grant, familiar now from the Tey novels. The author wrote chiefly under the signature of Gordon Daviot from 1929 to 1946, during which time her works included the play Richard of Bordeaux (1933), which ran for a year with John Gielgud in the lead part. The first of the Josephine Tey mysteries, A Shilling for Candies, was published in 1936 and was eventually followed by Miss Pym Disposes in 1947. Also included among the Tey mysteries are The Franchise Affair (1949), Brat Farrar (1949), To Love and Be Wise (1950), The Daughter of Time (1951), and The Singing Sands (1952). Elizabeth MacKintosh died in London on February 13, 1952.